Throughout our history the church has been the major edifice in any community. For all who sought to purify their religion, the simplicity of their architecture reflected the simplicity of their practice. The wood for the pews was donated by Brill Manufacturing and designed and assembled by the Village Carpentry Staff. The window in the narthex is a gift from the Scottville United Methodist Church. The sanctuary window, Calvary Cross and candlesticks are a gift from Grace Episcopal Church. The large stain glass window is a memorial to Samuel Arnott Snow, an early Ludington pharmacist. One of the pump organs was built by the Star Organ Company, circa 1860. St. Paul United Methodist Church donated the steeple when their church was remodeled. 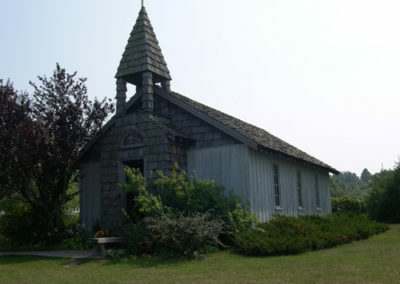 Today, the chapel is frequently rented for weddings, baptisms and memorials.